Poll: What do you want me to finish first? Poll: Do you like version 5 the best? Hello everyone. I don't think I'll ever update the pack again, so I give anyone the right to use it however they want, modify/continue it, distribute it, etc. Ornate 5 is an original 64x64 pack with an intricate and dark theme. The pack is now 64x only, 128x version has been discontinued. I no longer have interest in working on 128x textures for Minecraft. I think 64x is closer to the style of the game without being small enough to lose detail. I didn't need 128x for the level of detail I wanted anyway. I also did this because I want the 64x version to be as refined as possible because some people can't use the 128x version. Animals and monsters aren't textured, and as of version 5 the particles.png has been reverted to default. Also, a customizer may come soon but not at version 5's release. Since I'm anticipating 1.9 to be released soon, I may decided to add one then. I want to let everyone know that the next update will probably be late too. I'm still not really interested in the game, and with the amount of stuff added in the upcoming version(s), I think it will take several weeks for me to update it. It might be December before I update the pack. I'll try not to "disappear" though, and still answer questions. And as before, if someone wants to contribute and make some textures for the new items, you can PM me with the files and if I think they fit with the pack I'll use them to update it faster. I might modify them to fix better, though. Although, my one concern is as to why smoothestone is brick/brown-red ....Could i suggest a possible alternate, that still goes with the whole look? That is part of the original theme. There are a lot of real locations that have brown stone. I can try a less saturated version though. this texture pack is unbelievably gorgeous!!! It is really the most creative of all 128x128, and I am someone who is hooked on LB realism pack. I will now definitely download it bec it is something nice to have in my collection of texture packs. Holy crap it's like in some crazy trickster god's temple. 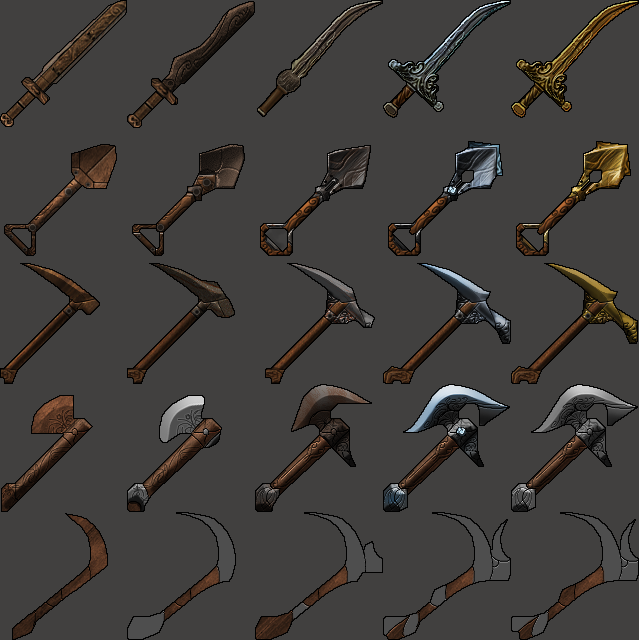 Working on items.. they'll all be hand-drawn I guess. I'm going to change the wood and stone ones probably. Thanks unimaginative man. Today I finished silhouettes of every item and started shovels. And re-designed the wood and stone swords. And hmm, I might plan to create a light version with gray/white stone and a lot of weathered copper accents. But not until everything is done. Really great work on the textures too, they look like they all tile very well. A very lovely texture pack. I never found a 128x tp worth using until I tried this one out. Wonderful job. Screw that, there hasnt been a very good 128x tp done in awhile. Of course, that was before this one. It blends in together just perfect and the style is Unique. I particularly like the items you are designing,havent seen curved swords created in MC yet. Perhaps have some more forms of ornate decoration on the swords such as rubies,text on the hilt(Small text if possible,but with 128x i doubt it) etc etc. Also you may want to work on glowstone to make it more glowstone looking along with Stone to make it look like stone rather than dirt. Yeah the glow stone is pretty bad admittedly :tongue.gif: I had no ideas for what to do with it. I'll definitely think of a change for the next update release though (probably in a day or two). I'll add some more things to the swords too I guess. Text won't fit, unless it's going along the blade vertically. Thanks though. This is the best texture pack I have used. Clearly still a W.I.P but a very good one. I applaud you sir.